As we begin a new year and a new reality in U.S. Federal governance post-election, it’s worthwhile to take stock of the state of the global economy. An important part of deciding where our society should steer with respect to policy is understanding what past decades have wrought. 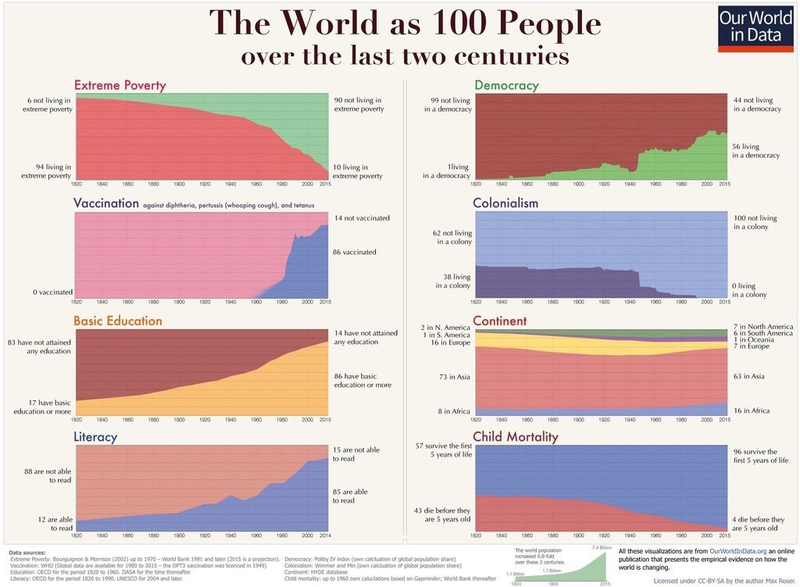 Max Roser—curator of a must-follow Twitter feed—has an important new essay, descriptively titled ” A History of Global Living Condition in 5 Charts.” His summary graphic is embedded below. Along the same lines as above, Jonah Norberg has a great new optimistic look at the world economy: “Progress: Ten Reasons to Look Forward to the Future.” Best brief summary from Business Insider here, including charts. Also, see The Economist, Reason Magazine, and the Cato Institute. 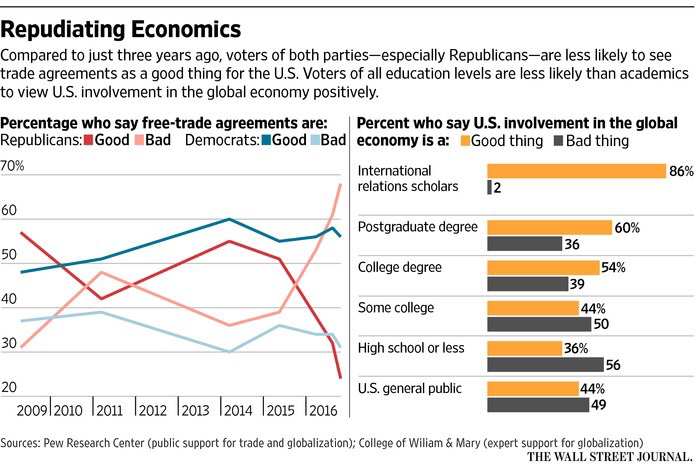 Related to falling trust in institutions and expertise, the Wall Street Journal has a look at declining faith in Economists and their ideas—particularly free trade and globalization. Another grim assessment here. Now, for some comedic relief: One of the funniest Podcast episodes I’ve listened to in some time from The Conservatarians. But, so long as the eurozone fails to deliver widely shared prosperity, it will be vulnerable to political and economic shocks. Complacency is a grave error. Things are at least improving. Eurozone real gross domestic product expanded by 5.5 percent between the first quarter of 2013 and the third quarter of 2016. Unemployment fell from a peak of 12 .1 percent in June 2013 to 9.8 percent in October 2016. Thus growth is running above potential. Yet this improvement has not offset the damage done by the financial crisis of 2008 and the eurozone crisis of 2010-12. In the third quarter of 2016, the eurozone’s aggregate real GDP was a mere 1.8 percent higher than in the first quarter of 2008. Remarkably, real domestic demand in the eurozone was 1.1 percent lower in the second quarter of 2016 than it had been in the first quarter of 2008. This extreme weakness of demand should not have happened. It represents a huge failure. A direct way of identifying that failure is in terms of nominal demand. In the second quarter of 2016, eurozone nominal demand was only 6.9 percent higher than in the first quarter of 2008. So what should it have been? Assume the trend rate of real growth is 1 percent, while the inflation target is close to 2 percent. Then nominal demand ought to grow at about 3 percent a year. If policymakers had achieved that, nominal demand would have risen by about 28 percent between the first quarter of 2008 and the second quarter of 2016. That must be too much to ask. But US nominal demand rose by 23 percent over this period. Moreover, the weakness of demand also had a strong downward effect on inflation. Year-on-year core inflation has not exceeded 2 percent since January 2009 and has averaged just 1.2 percent since that date. A severe challenge is the divergence in economic performance among the members of the single currency, with deep recessions in a number of member countries (notably Italy) and stagnation in others (notably France). According to the Conference Board, a research group, between 2007 and 2016 real GDP per head at purchasing power parity rose 11 percent in Germany, barely changed in France, and fell 8 percent in Spain and 11 percent in Italy. It will probably take until the end of the decade before Spanish real incomes per head return to their pre-crisis levels. In Italy, this seems unlikely to happen before the mid-2020s. The painful truth is that the eurozone has not only suffered poor overall performance, but has also proved to be a machine for generating economic divergence among members rather than convergence. Nat Hentoff has passed away. The Cato Institute remembers his incredible contributions to jazz, public policy, social discourse, and human freedom. Eli Dourado and Samuel Hammond argue for policy reform allowing for supersonic flight in their paper, “Make America Boom Again.” Absolutely. Endorse. Summary on Medium here. The House Freedom Caucus issues a list of “Rules, Regulations, and Executive Order to Examine, Revoke, and Issue.” Good work looking at regulatory reform with specificity. Bravo. On the federal level, two recent studies have attempted to quantify the cost of regulatory policy. The Competitive Enterprise Institute finds cumulative costs of federal regulatory policy totaling $1.885 Trillion, which is $14,842 per household, as detailed in the first graphic below. The Mercatus Center’s federal regulatory cost study—detailed in the second figure—found that regulatory growth since 1980 has made the economy $4 Trillion smaller in aggregate. Moreover, these figures ignore the costs of state and local regulatory policy.